Chicago Mayor Rahm Emanuel announced that he is not running for re-election. One response has been that he is the culprit for all these schools closing. I am a Chicagoan and spent half of my education in Chicago Public Schools. I am intimately aware of its flaws. Rahm may have many shortcomings, but the matter of school closings is not his baby. Rahm’s tenure as mayor has been contentious and this article only addresses his role with Chicago Public Schools. When Obama became President in 2008, people acknowledged that he inherited a mess — economic crisis and war on two fronts. Unfortunately, Chicagoans failed to acknowledge that like President Obama, Rahm had been dealt a terrible hand by Uncle Dickie (former mayor Richard Daley). Daley left Rahm a Chicago in economic disarray, a broken educational system (thanks Arne Duncan), and a fractured police department (Daley’s connection with police torture under Police Commander Jon Burge finally came to light in his last term). Daley’s privatized parking and the Chicago Transit Authority deals made bad reverse mortgages more appealing. Daley gambled the city’s financial security on getting the 2016 Olympics. Even though Chicago lost its bid, the city is still on the hook for over $140 million in land deals made in anticipation of the win. 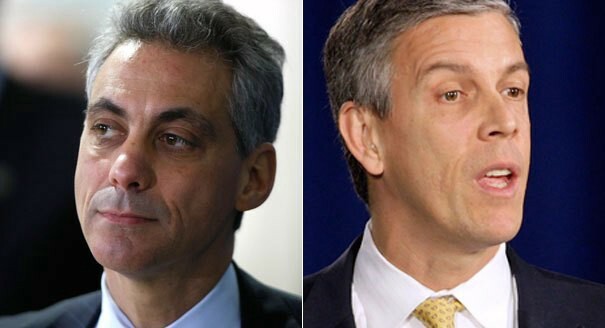 School closings were not initiated by Rahm Emanuel, but under Daley while Arne Duncan was head of Chicago Public Schools through his Renaissance 2010 program. As Tom Vander Ark notes, “in 2004, Duncan, the mayor and the business community launched new school campaign Renaissance 2010 which resulted in 13 charter networks, 70 new schools, and laid the groundwork for the next-gen models work New Schools for Chicago is currently supporting.” Arne was part of the growing trend to have non-educators with a business background run schools. Arne was a lawyer before becoming CEO of Chicago Public Schools. I voted for President Obama, but I was immediately disheartened over his appointment of Arne Duncan as head of the Department of Education because I was not convinced Arne did much good for Chicago, neither were other Obama supporters who voiced concern. The problems with Arne’s vision for CPS started to appear after he left for DC. His critics grew on the left and right. To add insult to injury, once Arne arrived in DC, he penalized CPS for not being up to standards. A system he ran for years is not up to standards. Whose fault is that? Definitely not Rahm Emanuel. Chicago Teachers’ Union (CTU) had a relatively nice relationship with Arne Duncan compared to other CPS directors. That is ironic because the problems they complain about Rahm (school closings, lost jobs, etc) were policies put in motion under Arne’s administration. According to Common Dreams, “two thirds of the 76 Renaissance 2010 schools are charter or contract schools. Not only do charter schools (since 2003) need only 50 percent certified teachers, but their teachers cannot be part of the Chicago Teachers Union (CTU) bargaining unit of 32,000 members.” Maureen Kelleher reported, “An analysis by the Consortium on Chicago School Research of reform across three eras — Duncan’s being the third — found that while high school graduation rates made real gains during the Duncan years, African-American students lost academic ground compared to students of other races.” Still, most loved Arne. Arne like other urban schools used NYC as a model. Unfortunately, NYC’s problems are unique from other urban cities in that everything in NYC can be tracked to a common denominator — lack of space. No matter the industry, space concerns are overriding in NYC. That is not a problem for Chicago. Neighborhood schools are essential to the community. Now kids are waking up early commuting to schools far away traveling through various neighborhoods with different gang affiliations. Even if you are not a gang member, you are not shielded from its violent effect. It is no wonder the gang problem in Chicago has escalated. Specifically, the conversion of Carver High School from a neighborhood school into a specialized military school was disastrous. Carver is located on the far south side of Chicago in the Altgeld Gardens projects. It is cut off from the city. If you do not have a car, transportation is limited to one bus that serves that area. I grew up in the “Gardens” until freshman year of high school when my family moved to the north suburb of Evanston, changing my educational fortunes for the better. Back then, the Gardens had a bunch of working class families with fathers working and mothers staying at home taking care of the children. Neighbors looked out for each other. Men would change their language when women or children were present. Many people had flower gardens in their front yard and vegetable gardens in their backyards. The Gardens was supposed to be housing for African-American soldiers returning from WWII. Therefore, it was military style barracks — townhouses with a front and backyard. Summer nights mothers would sit on front porches talking to each other while kids caught lightning bugs (aka fireflies), jumped double dutch, or played red light green light until it was time to come in for the night. The men and teenage boys would be in the back by the courts playing basketball. The Gardens had its own version of the Bud Billiken back to school parade, known as the Old Timers parade and picnic. The different blocks would compete to see who had the best cheer squad. Even though it was “the projects,” it still had an Ozzie and Harriet feeling with the benefit of the candy and frozen cup lady (frozen cups in Styrofoam with the extra syrup on top were the best). Despite being located across from a toxic landfill that caused many of the residents to be ill, I had fond memories growing up in the Gardens. I went to Carver elementary until my parents could afford to send us to Our Lady of the Gardens Catholic School. Local children would walk to Carver elementary, Carver middle, and Carver high school. Crossing guards knew the kids and parents walking young ones to preschool and kindergarten. You could not play hooky because the crossing guard would tell your parents. Although Carver High School was not a gifted center, it offered high school students who wanted an academic challenge the opportunity to take classes at Chicago State University. It was not like Cabrini Green or Robert Taylor Homes. It became that way once crack infiltrated the projects and gangs begin to flourish. When a young community organizer named Barack Obama arrived to discuss what is now known as environmental racism, it was the height of the crack-cocaine epidemic and gangs took over. This was a year or so before my family moved to the north suburbs. Under Arne Duncan’s administration, neighborhood schools like Carver High School were either closed or renovated into new education spaces that locals could not attend. Carver High School was turned into Carver Military Academy with a special admissions process. Isolated residents now had to bus their high school children to a school in a different neighborhood. In 2009, Derrion Albert, a high school teen from the Gardens was killed at Fenger High School, the school Gardens teens attended once Carver became a special admission school. Fenger is located in the Roseland neighborhood known as the “wild hundreds.” Derrion Albert was waiting for a bus when a fight broke out between Roseland teens and teens from the Gardens bused to Fenger. As students told the Chicago Tribune, “There’s a natural disadvantage for the Altgeld kids. They’re behind enemy lines, traversing unfamiliar streets in unfriendly territory. But they’re hardly running scared. They engage just as fiercely in the violence, students said.” That may have been prevented if Carver Military Academy remained opened to local residents. Before you blame Chicago Public School closings and failures on Rahm Emanuel, start with the originators of the problem: Richard Daley and Arne Duncan.